The following comments about attractions in Tomsk have been posted from individuals. We believe that the best reviews of Tomsk, Russia are written by travellers and holiday makers who have experienced Tomsk first hand and want to share their thoughts. Can you share yours? 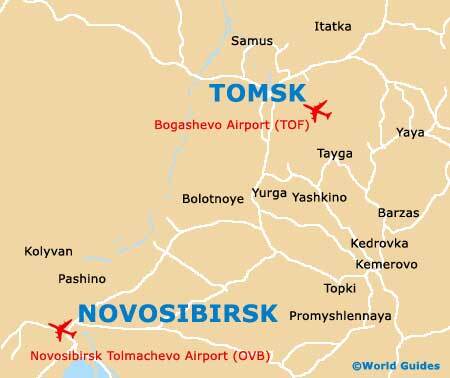 Please help us expand this section of our Tomsk World Guide. Let us know what you think about the attractions in Tomsk, Russia. Submit comments about Tomsk attractions here. Central Tomsk has many traditional Soviet features, around the Lenin Square (Ploshad Lenina). The monument of Lenin is perhaps of the better known, as well as the historic Magistrat Hotel. The Ozero Beloye is an important recreational space in Tomsk and we enjoy sitting outside a cafe, close to this large pond, and just enjoying the peace and quiet. You can also check your email at an internet cafe here, if you are suffering from cyberspace withdrawal symptoms. Close to the Solyanaya Street. Resurrection Hill is obviously a really noticeable feature in Tomsk and a fortress was built on this hill just over 400 years ago. There was a nice Golden Gate thing, which was made of wood an added quite recently I would imagine, by the look of it. Go up Resurrection Hill and up the Museum Tower. You have views across the city and the Tom River from every possible angle, lovely and uninterrupted views. When we came here recently, we enjoy walking along the Tom River. There were quite a lot of people about that day, and some boats. I think that you can have a cruise on it, but we were quite happy just walking and doing our own thing at our own pace. Please note that these Tomsk, Russia comments and reviews are posted by individuals and are not necessarily the views of World Guides.